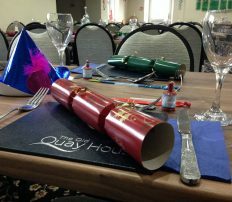 The festive season is always a special time of the year at The Old Quay House. 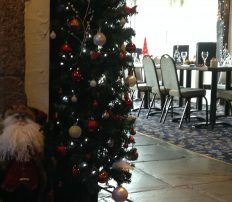 We take great enjoyment in greeting lots of happy guests over the Christmas and New Year period, whether you are joining one of our fun filled Christmas Party Nights, enjoying our Sunday Carvery with a special visit from Father Christmas, indulging in our scrumptious Christmas lunch or celebrating the New Year in. The Inn is festively decorated from head to toe, along with our renowned spectacular Christmas light display, which has become one of the must see destinations on the Christmas light circuit. Sit back and let us do all the hardwork this Christmas Day. Choose from our delicious 3 course menu which will be served between 12.00pm – 1.00pm and enjoy party hats, crackers and balloons. 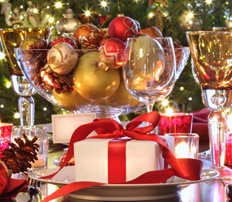 Whether you are a group of friends, work colleagues or a club, why not join us for a festive lunch this December? Available from the 2nd – 21st December (excluding 15th), pre-booking required, minimum 15 guests. served at lunchtime from 12pm and Dinner from 6pm. On Sunday 15th and 22nd December, we will be expecting a special visit from Santa at lunchtime (Santa will be in the restaurant between 12.30 – 1.30pm), with our younger guests enjoying a gift (under 10’s). Lunch – Open as usual at lunchtime including our full menu and specials board. Evening – Dinner will be served from 6.00pm – 8.00pm, with our full menu and specials board to choose from. Booking is essential, all dates re subject to availability, terms and conditions apply, subject to change without prior notice.